Being a soccer mom is a complete joy for me. I love cheering. LOUD. I dig the heck out of the rockin’ parents on our team. OK it’s not about winning, but we’re really good. Truthfully Sam is improving a ton–and he was good to start. His corner kick is collegiate! That attention span is increasing too. I was even invited to help the coaches for the “being aggressive to the ball” practice last week. (Did I let it slip that I had fourteen or so years of playing in this old foot locker!) Our coaches really rock. I mean who else can tell me to shut my horn with this kind of diplomacy; “Sam reports that he is having trouble focusing on the field with both of us giving him directions. Would you like me to stop coaching on the field?” OUCH! Back to the orange slices for me! Of course I was the first to volunteer to bring the half time treat! I’d do it again too. My heart crumpled when I realized that there were only three more games left. Not a fan of team sports (but loves the one on one pass, or a pick up game with friends) Marcel is becoming quite the artiste in his own right. 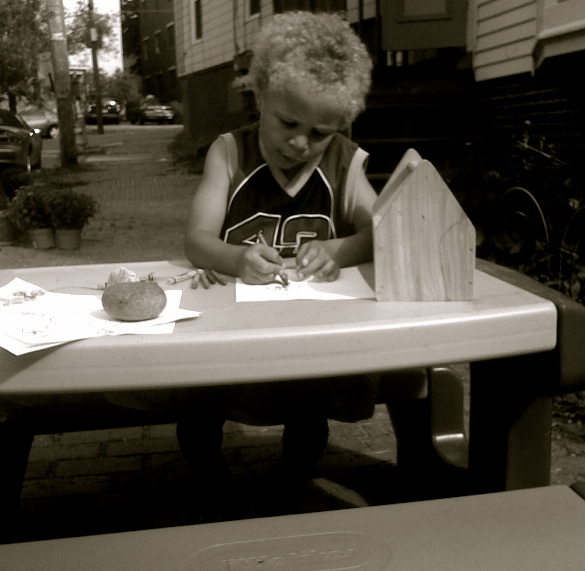 Sunday, before the soccer game he grabbed a clip board from my desk– packed a baggie of crayons, and his notepad. He made a “playbook” for one of the coaches in the car and insisted Sam give it to him before the game; “So he knows how to coach you Sam!” (But Mommy has to be quiet during the game,” he added from the back seat!) He handed out works of art to many of the gracious parents. 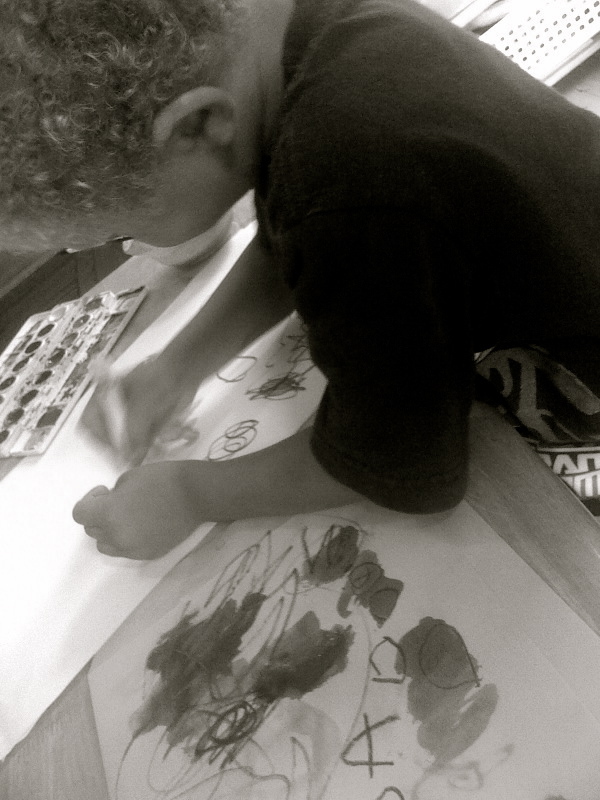 He absolutely loves to draw. What I dig the most is how focused and intense he gets. The world goes away when he is drawing. I’ve seen the focus before with his Legos, and blocks–but this seems to be a release for him on a different level. His crayons are like Sammy’s cleats. They are the tools he uses to practice doing something he loves. He expresses himself on the playing field of a white pad, a recycled school lunch menu, and Mama’s walls. His markers are his soccer, and baseball. And my grand, albeit much softer, proclamations of his amazing efforts are my screaming on the sidelines in a way. Becoming an artist consists of learning to accept yourself, which makes your work personal, and in following your own voice, which makes your work distinctive. Being a Crayon Mom is quieter, often stationary, and just as important. It is about buying frames at the thrift store, and having lots of tape available for the impromptu art gallery. It is about finding art classes, and reminding the young illustrator to sign his name on his works of art. Like Sammy’s corner kick, Marcel too, will have that signature trait to his art that will be recognized for years to come as skillful and unique. Recently I’ve been trying to imbue his work, and all the many taped up results (windows, every wall in my room, the cupboards, and tonight there was one under my pillow) with the same thrill I create around his brother as the hot shot athlete. I want to help him validate his skill–to feel the same MEGA importance the athlete naturally garners. Watching him I am reminded how I feel the same way when I make time to write. You may never letter in crayon carrying at the high school--but by then perhaps he won’t need that kind of recognition for doing what he loves anyway. He’ll just do it, because it soothes him, and not to not do it–is not a choice. I was super successful in soccer–and so find it comes easier to celebrate Sammy’s success there too. While never the winner of the coveted elementary school art awards–I also enjoyed the making of art for sometime too. The more I notice Marcel’s passion, the more I allow my own inner crayon grasper to remember just how exhilarating it is, to make your mark on that construction paper field as well. My oldest is the artist. 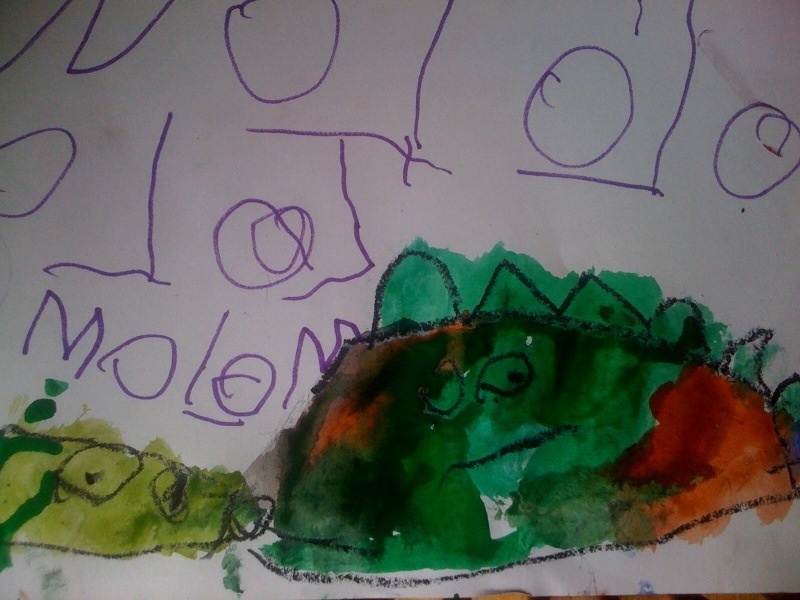 When she was small she would come to me with her paper and crayons and ask me to draw, an elephant, a dog, a cat, a horse. I would make my feeble stick drawing attempt, and then ask her to go make me one that was better. She always did. Now she is in college in the design program, painting, drawing to hearts content, and I am cheering on my little athlete Mea at home. Different cheering, but cheering just the same. Sweetest story. Thank you for sharing it! What a beautiful blog, Catherine!! You expressed so well the need for cheering on your little artist. If the alligator and fishing line is typical — how wonderful!!! LOVE! I am a Crayon Mom, too! 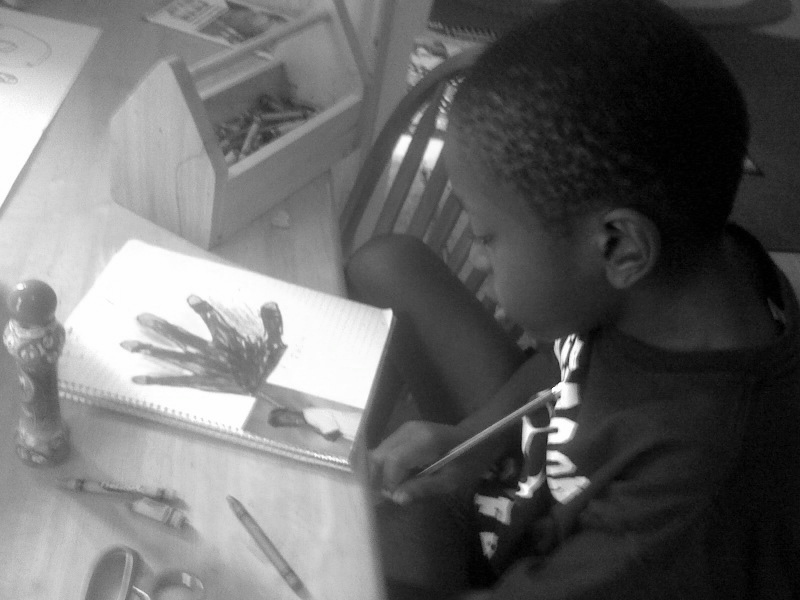 Isaiah loves to draw. He even stops Wes from playing with him because he’s “working”. I love that about him for so many reasons… I am an artist too (the writing variety)… being the most obvious… but also because its a piece of my brother who passed. My brother Tommy was an awesome artist, he would have been SO proud of his nephew. I am so proud of my baby. Love this, Catherine. Go Marcel! One of the things I love about our school district is the district wide art show that they do every year at the high school. The lower grade kids that all take art all have a piece or two exhibited; and the high school artists (almost called them kids but decided it totally didn’t fit)that do art as an elective have multiple works on display. All of them are amazing. We make it a point to go on opening night. I love the way being an artist is as acceptable as being athletic. Wendy–so great that you go honor the artists on opening night! Your boys are amazing. And seeing their world open up when their mom allows that space for them is beautiful. LOVE it.